The holidays are supposed to be a time of happiness and celebration but instead, one of the most hauntings mysteries to ever occur in West Virginia – and perhaps even in America – began during the predawn hours of Christmas Day 1945. That day would mark a vanishing, perhaps even a mass murder, which has never been solved. On that cold Christmas night, five children seemed to have been lost in a mysterious fire that destroyed their home. But were they? Their bodies were never found in the ruins and the children were later sighted in various places, creating a puzzling, complex mystery that is as strange as anything that could be found in detective fiction. What happened to the Sodder children? Did they die in the fire, or were they kidnapped for unknown reasons? And if they were, why has no trace of them ever been found? The Sodders would continue their search for the missing children for nearly 50 years, going to their graves with the mystery still unsolved. It was the holiday season in the West Virginia countryside near Fayetteville. A light snow was on the ground and all seemed right with the world. George Sodder, Sr., and his wife, Jennie, were the proud parents of 10 children and lived in a new home outside of town. George, a 50-year-old Italian immigrant had recently started a new coal-trucking firm from his home and it was already prospering. One of the Sodders’ sons was in the Army, but because World War II had ended several months earlier, he was out of danger. The rest of the children were celebrating the season at home with their parents. The Sodder children opened their presents on Christmas Eve, including toys that had been purchased by 17-year-old Marian from the dime store where she worked in Fayetteville. George went to bed early that night and so did the two older boys, who worked for him in the coal-hauling business, John, age 23, and George Junior, age 16. The other children, Maurice, 14, Martha, 12, Louis, 10, Jennie, 8, and Betty, 5, all said they were too excited to sleep, but finally turned in around 10:00 p.m. Jennie took two-year-old Sylvia to bed with her soon after, looking forward to a good night’s sleep before the holiday festivities of the next day. But Jennie was not going to get a good night’s sleep – not that night, not for the rest of her life. In the account that follows, I have attempted to chronicle everything that I know that happened to the Sodders over the course of the next hours, days and even years – no matter how insignificant or strange that it seems. There was something very unusual at work in their lives and what it may have been, no one can – or is willing to -- say. Jennie was roused from her sleep the first time, shortly after midnight, by a ringing telephone in George’s home office downstairs. It was very unusual for anyone to call the office line at such a later hour, so Jennie got up and answered it. The caller was a woman, who apologized for dialing a wrong number. Jennie accepted her apology and returned to bed. Soon, she drifted back off to sleep. But only a half hour passed before she was awakened again. This time, she heard a sound like a heavy object landing on the roof of the house. There was a loud thud and then it bumped and jostled its way from the highest pitch of the roof to the gutter. She waited for the sound to be repeated, but when it wasn’t, she went back to sleep. About 30 minutes later, she woke up again. She wasn’t sure what was wrong – and then she smelled smoke. Leaving her bedroom to investigate, Jennie found that flames were already spreading through George’s office. She rushed back to the master bedroom where her husband was sleeping and they shouted upstairs to rouse John and George Junior, who shared a room in the attic. George also shouted toward the other bedrooms on the second floor and thought that he heard all of the children answer him. John and George Junior made it downstairs and out of the house with their parents, Marian and little Sylvia, but the other five children never came out. George then seized on another idea. He would drive one of his coal trucks up to the house and stand on top of it to reach the windows. But both trucks – each of which had run perfectly a few hours before – refused to start. Marian Sodder ran to a neighbor’s house to telephone the Fayetteville Fire Department, but the neighbor could not get an operator to assist her. Direct calls could not be made in the area at the time. All of them had to be operator-connected. At 1:00 a.m., another neighbor drove past the scene, saw the blaze and hurried down the road to use a telephone at a nearby tavern, but again, no operator responded. Finally, he drove into town and got Chief F.J. Morris on the line, informing him that the Sodder house was burning and children were inside. But even after this call, the fire department did not arrive until 8:00 a.m. – seven hours after they learned of the blaze. The lapse was explained by the department’s lack of manpower during the war and by the chief’s inability to drive Fayetteville’s fire truck. Morris had to wait until he could track down a qualified driver and Fayetteville didn’t have a fire siren in 1945, so they had to rely on a “phone tree.” An operator would call one firefighter, then another and another. But with no operators seemingly on duty, the calls took hours to complete. By the time the firefighters arrived, the Sodder home had been reduced to a crumble of ruins over a smoking, ash-filled basement. George and Jennie were heartbroken, assuming that their five missing children had died in the fire, but evidence soon emerged to point in other directions. A brief search of the ruins ended at 10:00 a.m. on Christmas Day, with Chief Morris telling the Sodders that no trace of the children could be found. He suggested that the fire was hot enough to completely cremate their remains and he instructed the family to leave the site as it was, pending a more thorough search. George waited for four days, then obtained a bulldozer and covered the basement with five feet of dirt, explaining that he planned to plant flowers and preserve the site as a memorial to the children. A coroner’s inquest stated that the fire was accidental and blamed it on faulty wiring. Death certificates were issued for the Sodder children on December 30. But were they actually dead? Today, we know that the fire, which leveled the Sodder home in about half an hour, never reached the temperature required for the total cremation of human remains. That would have taken two to three hours and would have required a temperature of 1,400 to 1,800 degrees. In fact, various household appliances found in the burned-out basement were still recognizable. Stranger still, a telephone lineman summoned to the Sodder home site reported that the telephone line had not been burned through, but rather had been cut 14 feet off the ground and two feet from the nearest utility pole. Neighbors directed the police to a man whom they saw at the scene of the fire, stealing an automotive block and tackle. He pled guilty to the theft but denied any role in the fire, although he did admit to cutting the telephone wire, allegedly mistaking it for the power line. His identity and motives for cutting any of the lines at the scene remain a mystery. A late-night bus driver disputed the coroner’s verdict of an accidental blaze at the Sodder house, reporting that he had seen unknown persons throwing “balls of fire” onto the Sodders’ roof. In March 1946, Sylvia Sodder found a green, hard-rubber object near the ruins, which some believed was some sort of firebomb. The Sodders later claimed that the house had burned from the roof downward, rather than from the ground floor up, but no evidence remained to prove their story. However, the idea of firebombs being thrown onto the roof might explain the strange noise that Jennie heard when she was awakened a short time before the fire started. And then the sightings began. First, the manager of a motel that was located halfway between Fayetteville and Charleston, West Virginia claimed that he saw the five Sodder children there on Christmas Day. 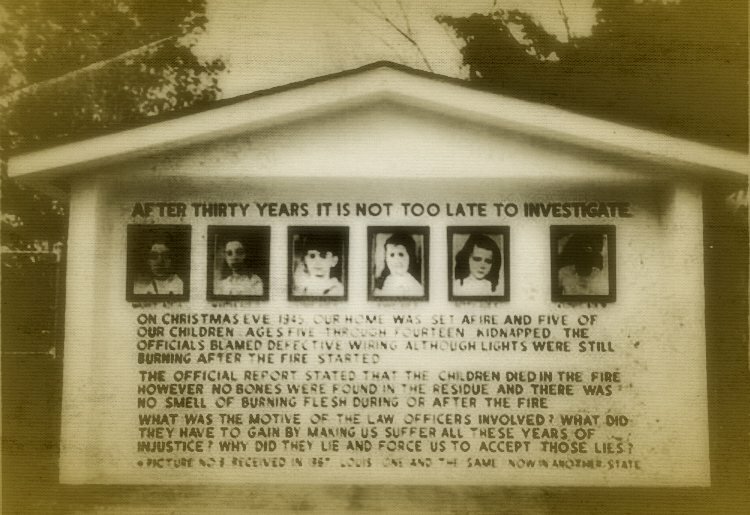 A resident of Charleston later said that he saw four of the children – Martha, Louis, Jennie and Betty – with four unknown adults, about one week after the fire. The adults spoke Italian and were never identified. Suspecting that the children had been kidnapped, George and Jennie hired C.C. Tinsley, a private investigator from nearby Gauley Bridge, to look into the sightings and pursue the case. Tinsley went to work, not only trying to run down information about the children, but also looking to see who might have hard feelings against the Sodders and if any possible enemies might have had something to do with the fire or with kidnapping the children. He discovered that the Sodders had been threatened in October 1945 by a Fayetteville resident who tried to sell them life insurance. When they told him that they weren’t interested in his sales pitch, he warned them that their house would “go up in smoke” and their children would be destroyed over “dirty remarks” that George had made about Benito Mussolini, Italy’s fascist dictator, who had been lynched in April 1945. Interestingly, the same insurance salesman had been a member of the coroner’s jury that decided that the fire at the Sodder house was accidental. In 1947, a church minister from Fayetteville told the Sodders a strange story. While Chief Miller had claimed that no remains were found at the fire scene in 1945, he privately claimed to have found “a heart” in the ashes, which he placed in an empty dynamite box and buried at the scene without reporting the discovery. Tinsley and George Junior persuaded Chief Miller to show them where he had buried the box. They dug it up, took it to a funeral home and asked the director to open the box and examine the contents. Inside was what looked like a decayed beef liver. It was untouched by the fire, meaning that it had been placed there after the blaze. But for what purpose? No one knows. Later in 1947, George Sodder saw a newspaper photo of several New York schoolchildren and insisted that one of the girls was his daughter Betty. He drove to Manhattan in search of the child, but her parents refused to let him see her. Unable to come up with a plan to get another look at her, he drove home disappointed. In 1949, Tinsley and the Sodders started a new search of the fire scene, discovering four human vertebrae. State authorities refused to examine the bones, so Tinsley sent them to the Smithsonian Institution in Washington. Experts there determined that the vertebrae belonged to a male between the ages of 19 and 22 – an age range that did not match any of the missing children. Published reports stated that Tinsley later traced the bones to a cemetery in Mount Hope, West Virginia, but no explanation was available concerning their theft from an unidentified grave or how they managed to end up at the Sodder fire scene. With the Smithsonian report in hand, the family persuaded the FBI to take an interest in the case. In 1950, a file was opened on the Sodder children as a possible interstate kidnapping, but FBI agents only pursued the case for two years with no results. Around that same time, the West Virginia State Police also looked into the case, but with the same amount of success – or lack of it. In 1965, the Sodders received a photograph of a young man in the mail. On the back of the photo, a handwritten note read: “Louis Sodder. I love brother Frankie. ilil Boys. A90132 or 35.” While George and Jennie were convinced that the photo was an older-looking likeness of their missing son, they could not interpret the cryptic message on the back or trace the sender of the photograph. Even so, the family clung to hope. In 1952, they erected a billboard near Ansted, West Virginia, that displayed photographs of the missing children and offering a $5,000 reward for information leading to their whereabouts. It brought no useful tips, but created a lot of speculation. Rumors abounded, including stories of Italian fascists, mafia gunmen and orphanages that snatched children and sold them to childless couples. The Sodders spent the rest of their lives searching for the missing children. George Sodder died in 1969, still hoping for a break in the case. Jennie lived another 20 years, and she never gave up either. The billboard in Ansted remained in place until her death, when it was finally taken down. Today, the youngest surviving family member, Sylvia Sodder Paxton, keeps the family’s haunting story alive with help from her daughter, pursuing leads on the internet or wherever information might come from. To this day, though, the case remains open and unsolved.